Shopping with the kids is an exquisite kind of torture. It costs me $4 before entering the supermarket to get the requisite sausage sizzle which is being sold by boy scouts or ballroom dancers or hot-rod racers – always an organisation my daughters have little to no connection with. Within minutes of entering the supermarket, the sausage is sliding down aisle two and somebody is crying. I gain six minutes of alone shopping time while the kids go back out to buy another sausage – but that does cost me another $2. Sometimes in the throes of this speech other parents cruise by with toddlers in their trolleys or kids dragging behind them. I always thought they were detouring past me so their kids would catch a whiff of my lecture. Now that I type this and think about it, I realise their trolleys are empty and they are probably trying to send me an important parenting signal. “Do this area first dude!” They are probably trying to say. “Save this lecture for the privacy of aisle 3.” Hmmm – mental note – conduct parenting experiment and shop in reverse. Note effects. If any. I always know when we are precisely mid-way through the shopping experience because somebody will need to use the toilet. It doesn’t matter if we went before we left. I wonder sometimes what’s in the sausages. The supermarket toilet is a skanky place. And I’ve seen every supermarket toilet within a forty kay radius of my house. It’s true for all of them. My kids seem completely unaware of the germs and filth that welcome us as we all shuffle into the cubicle while our abandoned trolley is left in aisle 5. They actively try to touch every surface and they are always shocked when there’s no paper towel in the dispenser. Seriously. Back in the supermarket I will occasionally run into a friend I haven’t seen in forever or a friend I really need to speak to. This is a situation I both love and loathe in equal measure. There’s nothing that brightens the coma of shopping quite like a quick goss with a mate. On the flip side, my kids hear the words “Hey Gab – great to see you,” as a direct translation to “On your marks, get set, GO!” They will race up and down aisles, do circle work around me and my friend, hit the deli up for a free frank, find the Free Fruit For Kids stash and stock up. The youngest has recently added stealing the mushroom bags to her ‘when mum’s not watching’ repertoire. My kids love the check outs. They like self-serve or real person in equally. If we go for a real person, my kids engage them in conversation and some poor gap-year 18 year old looks at me with a pained expression and says something to Sophie like “I’m not sure what colour most unicorns are.” Alternatively, they may provide running commentary on the goods we are purchasing. “We’ve just got a cat. This is for his kitty litter tray. He peed on our bean bag last night and mum said a bad word. We’re going home to make cupcakes it’s just easier from the box mum says. We’re getting this play doh for my friend’s birthday….” Blah blah blah. Sometimes the real person is a delightful older person who appreciates the running commentary and seems to really enjoy the girls’ chatter. I avoid those types though because they seem to scan more slowly, trying to draw out their time with us like a wistful wannabe grandparent. If we use the self-serve it is a definite “special occasion”. The kids are drawn to that machine like bugs to a flood light. They can find a barcode within seconds and I realised the other day I was in about Year 9 commerce before I realised what a barcode even was! They talk to the automated voice. Yep. Let’s just sit with that for a moment. So they figure the voice on the machine is a lady named Vanessa. They believe she is Siri’s sister. The process goes something like this. Scan, dump, chatter. Repeat. By the time all the groceries have been chucked through, I am frantically bagging stuff reminiscent of an Aldi experience but a lot more expensive. The girls raid my wallet and try to insert coins, then insert notes and then insert card. It is a very stressful experience for me and I have to guard my PIN closely. 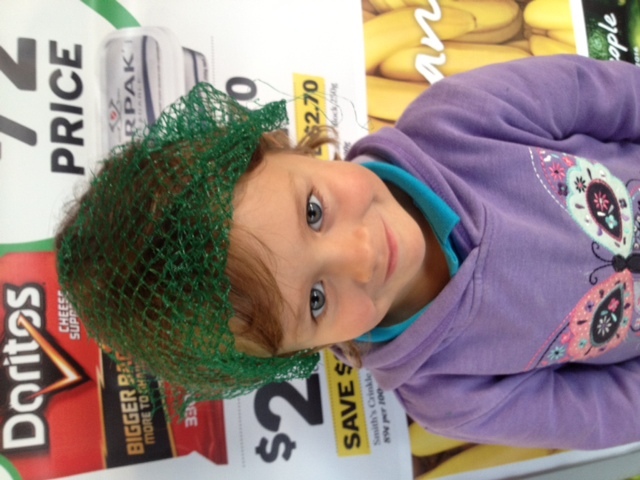 As we left the supermarket the other day, the youngest scabbed an onion bag from the checkout bin. I gathered up our millions of dollars worth of groceries and turned around to find her wearing it as a mask and looking like some sort of fishnet ninja. I stopped and took a photo. Because what else can you do? You had me in tears of laughter over this, I can laugh now that my kids are big, but I can remember those days of doing the groceries with 3 kids under 5!! The amount of items they would eat whilst shopping and I would be passing empty packets of god knows what or how they can consume so much junk in one little shopping trip, to the checkout chick to scan. I could feel the judgemental look, but I knew one day that young girl would have kids and she would remember me and then she would get why and how. Glad it made you laugh Kylee. I feel embarrassed sometimes about the lengths I’ll go to to avoid the supermarket. No fruit for school lunch box – I’ll pack vegies. No fresh vegies for dinner – hello frozen packet! No marg for sandwiches – here’s some cooking butter I can soften in the microwave. I look forward to the day they can wait in the car. Or stay home. Or better yet – do it for me! Thank you for giving me hope Ky.
God you’re sooo funny. Thanks. I love it! The funny thing is, I can actually hear you saying all these things to the girls. ? ?